Okay, so I'm no Fake Plastic Fish. I don't avoid plastic like the plague as much as I should, although we've made some great strides in reducing the amount of plastic that comes into the house. Our biggest problem is food, but that's for another post because today I want to talk about another area of the kitchen. Since my kids were born, starting almost 8 years ago, we've used plastic plates, bowls and cups for them, mostly because they tend to drop and break the heavier stuff. And the glass and porcelain dishware we have is generally too big for them for the most part. But, with all the issues with BPA and plastics lately, I finally got off my keister and cleared the kitchen of all plastic dishes and cups. I, personally, stopped using the plastic stuff a few years ago, but now we all are plastic free. We replaced the plastic plates with adult sized porcelain ones and, for the bowls, we bought smaller porcelain ones for cereal and the like. We bought more small glass tumblers for the kids (we only had a few in the house) since the large ones are too huge for them. They have been getting a kick out of using "adult" dishware and I've been happy to finally rid the kitchen of all that plastic crap. I hated wondering if it was leaching in the dishwasher and I hated when visitors accidentally microwaved food in them (ick!). I'm not sure why I feel such a huge sense of accomplishment with this, but I guess it's been bothering more than I realized. We still have a way to go with food storage containers. We have some lidded ceramic ones, but I would like to get some in clear glass since you can't see what's in the ceramic containers with the lid on and we forget what the heck is in there and it rots in the fridge. Our biggest issue is really containers for lunches. The glass and ceramic ones are so heavy I don't expect the kids to lug around a 20 pound, breakable lunchbox. And I don't want to either, for that matter. So, for now, it's plastic. Does anyone have suggestions for lightweight, non-plastic lunchbox containers? Are there any light steel ones out there that you like? What you want is a metal bento box. Here's one company, http://www.ecolunchboxes.com/ Pikko did a review of them on her bento blog http://www.aibento.net/2010/02/24/the-princess-and-the-edamame/ . And another review of a similar product on this site. http://lunchinabox.net/2009/03/25/review-kids-konserve-metal-lunch-kit/ Sigg used to make sets geared towards kids and some plain ones for adults. I don't know if they still make them though. I was at Target yesterday and noticed they had some clear glass storage containers with clear glass lids. (Most of the clear glass containers I'd seen locally up until then had plastic lids.) You can also find them on Lehman's website (www.lehmans.com). Lunchboxes are a nonissue here, but I wondered if maybe you could find bento boxes that aren't made of plastic (if you haven't already checked into bento boxes, that is). It's nice to get rid of the plastic plates/cups/glasses!! I keep one juice-size plastic cup for when my youngest niece is here, but it won't be too much longer before she's able to comfortably handle glass cups. Just curious - but what happened to the plastic you discarded? Thrifted, recycled, tossed? I ask because that's part of the whole plastic issue - not only do we need to pay attention to not having it in our homes for health reasons but once we've bought it we're responsible for how it gets disposed of. We're such over consumers that we all have TONS of it in our homes - and when we really wake up to the problem it's a really tough one to dig our families out of. Can't wait to hear about the food packaging. It's a huge one for us too. Especially when some foods only come wrapped in plastic or Styrofoam. Most fresh can be put into our own bags - but not always. So we are put into the position of not buying it or dealing with it. My youngest is using LunchBots, Uno for his sandwich and Pico for his apple and cucumber. I'm quite happy with these. Also, what about the extra resources to make, transport, sell the new stuff you bought? We are slowly replacing the plastic in our house, but this is something I think about - am I not just causing unnecessary resources to be used. For lunch containers - tiffins are pretty cool to use. weird, I just posted about stainless steel lunchboxes... lol. main gist- i heart my stainless steel lunch box. but- you need to remember that if the kids are reheating stuff they need a plate or bowl also to go with them. also, unless you get ones with a plastic-rubber lip on them, most 100% stainless steel lunch boxes leak- so soups and stuff not cool. We use LunchBots here as well for all the kids. We have them inn two sizes and they are easy for the kids to open. We also have small Thermos containers for hot meal days and Thermos water bottles that are BPA free. My hubby uses a glass bottomed container that he pulls the lid off to microwave, but there has been a time or two that a bento style LunchBot has made it into his bag. For salad dressing or dip, I use baby food jars, perfect size and they have screw on lids. We use some we got from our local Indian store. They are round and stackable and now I'm seeing them everywhere. I've also seen the Sigg ones and they look very cool, but expensive. 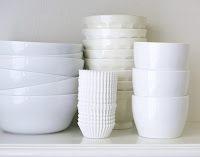 Good for you fro transitioning - we always used ceramic and glass - I just gave up on having anything match and just starting buying white from Ikea since we break about 1 to 2 items a week. And I echo Sahara Sky about what you did with the plastic as this is an issue for me as well. Don't want it anymore, but am I creating another problem? you can also get stainless steel or enamel covered metal plates for kids. That's what we have now to go along with the glass and pottery plates. I got rid of most of my plastic storage containers and got a bunch of glass ones. My new Pyrex glass storage bowls have plastic lids, but each lid is marked "BPA free." I don't put the lids in the microwave, but am not worrying about the dishwasher. Cross your fingers on that one. I'll follow this comment section with interest as I would also like to get away from plastic storage containers. As for lunch containers, Julie over at Towards Sustainability posted a little while ago about the wax-lined cloth wrap she made for her daughter's sandwiches. She had to re-line it after a year's use. So that might be something to look at/pursue if you're at all handy with a sewing machine. She sure seems to be. I rarely need to pack lunches, but I've usually favored wrapping sandwiches in aluminum foil when I have to. AF isn't perfectly sustainable, but it can be washed and reused, and it sure holds a sandwich together much better than a plastic bag. My son starts Kindergarten in the Fall- so, like the big nerd that I am, I have already been researching all the bentos and other lunch "systems"...haven't made a final decision yet so I am enjoying these comments. I wanted to recommend Corelle dishes for kids at home though. They are light, inexpensive, safe durable, and made in the USA! We switched to them about a year ago and my 1 year old and 4 year old are now 2 and 5 with a full set still intact. You can buy singles easily so they use the luncheon sized plates and the small bowls and they are perfect for them! We recently starting using 4 oz Ball canning jars for homemade pudding or applesauce to go in the cold lunches. Nothing new or fancy to buy! I guess "got rid of" plastic dishes should logically mean where they do the most good, for the least energy. A yard sale, or the Salvation Army thrift store. That way no more demand for (plastic) cups and plates is created, those needing some don't create a demand, and reusing alway takes less energy. Incinerating, if you believe they are too dangerous for anyone to use, would be the next weak choice - the carbon in the soot would have a limited environmental effect, and the release of the rest of the toxins would just be hastened on their decay time frame. I mean, it isn't like someone would keep a bit of plastic, like the hand mirror my grandmother used, for 42 years. Oh, wait. Never mind. When dumping the plastic plates and lunch box - how about polyester blends in clothes and backpacks? Just a thought! My husband and I are too clumsy to use glass plates ourselves. We had been using paper plates pretty routinely with the bamboo plate-holders, but now have eliminated paper plates completely in favor of wooden ones. These were purchased for my daughter's wedding last May but didn't come in time. We have at least 60 of the 8" as well as maybe 50 of the small ones for snacks, cake, etc. They're absolutely wonderful, IMO, taking less space in the dishwasher than a glass plate. My daughter likes them so much that she asks to take leftovers home on them. They do hold the heat from microwaving, but I don't think they leach anything. I think teaching kids that things break when dropped rather than giving them plastic is a better idea. A good reason not to give them plastic tea sets, too. Likewise letting them use sharp knives (with appropriate supervision of course) etc is the best way to learn that being careful is important. We all need to be wary of the "I'm off to buy something new & green" temptation! For food storage I use Pyrex. Get a little pail like on Little House on the prairie! That'd be so cute! A little stainless steel canteen or thermos. I like the wrap n' mat for sandwiches, but it's plastic lined. I have seen tutorials to make your own, but I think they have plastic too. You just wipe it clean, don't heat it up, so I don't worry about leaching. For lunches and leftovers I bought some vintage refrigerator dishes online. No plastic, no new materials, and very pretty. To take to work, I put a thick rubberband around each to hold the lid on (for some reason I ended up with the bands from broccoli, or something) and stack them in a sturdy washable bag. I put a cloth napkin in between dishes, so they don't clink together (and so I have a napkin!). For liquids or sauces I use different sized mason jars. We transitioned to glass for adult lunches a while ago, using Pyrex with plastic lids. I've had these for at least 10 years (darn near indestructible) and I'm happy with them- I'm not willing to get rid of them just because they have plastic lids. The kids' stuff is a whole 'nother ball of wax- we, too, have a ton of plastic and am trying to transition away from that. I really like the Lunchbots! I've been looking a stainless steel tins and I think those are by far my favorites. I also want to get some of those wax/cloth wraps or Lunchskins (http://www.reusablebags.com/store/lunchskins-sandwich-p-1883.html)to cut down on how bulky the kids' lunchboxes can get with containers (plastic or otherwise). The kids' plastic stuff I have had for 8 years, and will most likely use for craft storage when I transition to the non-plastic stuff. I've been gentle with it(no heating, no harsarsh abrasives etc) to cut down on the possibility of leaching (even though they are all "safe" plastics), but I think they need to be retired from food use, so I will *not* be donating them to Goodwill/yard sale etc. And BTW, my kids LOVE using "real" cups and dishes, too. I was worried about breakage but the Pyrex stuff has taken a beating from them and is still ticking; I also have some vintage juice glasses and shot glasses (!!!) that are perfectly sized for small hands. Also, a great company where you can find plastic-free lunch/foodware is Life Without Plastic. lifewithoutplastic.com. While they are in Canada, they are a terrific company. I have met the owner, and he is a very committed, genuine person. Don't forget the old standby: brown bag lunches. Brown bags last for several lunches and can be composted when they're shot. For wrapping sandwiches, cookies, etc, we use Nature's Way waxed paper sandwich bags. I found them at Whole Foods. We compost those, too. As for food storage, we use a variety of new glass, old glass from antique and junk shops, and waxed paper, aluminum foil, etc. When I was growing up plastic storage hadn't even been invented yet, but we managed to save and store just as much food as we do today, so getting rid of the plastic storage (which we still have, but store art supplies in them) has been kind of a trip down memory lane. For hot things, I use a stainless steel thermos I bought at Target, instead of zapping it in the microwave at work. There are food thermos with metal lids. We've been letting our kids use the "real" plates & glasses since they were about 18 mo. We're still given plastic kiddy utensils and plates, which the kids think are "special" - which drives me nuts. School lunches. I've been packing school lunches since they were in daycare (which incidently, asked for no glass - that might be an issue at school too). Because my 5-year-old dd "requires" 2-3 snacks PLUS her lunch, I have to keep in container size in mind. We have a Japanese "dollar" store near us called "Daiso". Instead of $15/container (Lunchbot), they sell smaller containers for about $1.30 (food grade stainless steel). They have plastic lids, but they're not heated up & I don't think the food actually comes into much contact with the lid. Like everything, it's a tradeoff. I do like that I can use a tiny 1.5" x 2.5" container for cut kiwi. Other options that I looked at were cool, but just didn't offer the flexibility that I need with dd's snacks. Also note that sandwiches can be wrapped in a cloth napkin just fine. I learned this AFTER I bought the wrap n' mats of course! ;-) And of course, a small Klean Kanteen bottle for water. Don't overlook cheap-o cutlery rather than plastic spoons. And Voila! A waste-free lunch box! For leftovers storage, we use glass peanut-butter jars (I run a family child care, so that means a lot of peanut butter!). They work for far more things than you'd expect, and are free. Your readers are so creative! I remember brightly-colored aluminum sandwich containers from a long time ago. Don't know if they still exist. Here's a question for, perhaps, another post. How do you avoid plastic when freezing fruits, veggies, home-made soups and leftovers. @dee dee, I freeze some things in glass canning jars. I may start to do more of this as I become more aware of and concerned about plastic. Some fruits and veg can be spread out on a baking tray until frozen and then packed up in containers of any kind. With liquids it's much more critical to remember to leave a gap for freezing expansion when using glass as opposed to plastic. Plastic gives, glass does not. A friend recently remarked on my half-gallon canning jars. She'd never seen such a large size before. So just thought I'd mention that they're out there. I also use canning jars. To keep them from clinking I made wrap around cozies from leftover yarn. If you do not knit then it would be easy enough to make it out of scrap fabric. I find that they work great and it was no extra cost to me. For my lunch, I use an older to go ware 2-tiered lunch box (pyramid?) or just the "pyrex" type containers we use in the fridge. Said containers were found at Costco - they have silicone lids that snap down (read - don't put curry all over the inside of your bag) and can go in the nuker if need-be. Hubby didn't wanna feel like a dummy... so he either uses an old bag (e.g. grocery) or the pyrex (although it's labeled... boys just don't bring stuff home). A lot of the time he comes home (a whopping mile from work) for lunch though. We also use home-made versions of the wrap-n-mat - I used a thrifted outdoor table cloth, sewed another fabric to what was the back, and added a ribbon to tie it all closed. They work very well - even for things like grapes! (they also double-duty as a compost carrier and/or napkin). In the fridge, you'll find lots of glass containers - said "pyrex" type from Costco, bowls with plates as lids (unless hubby plasticifies them before I get to 'em), lots of re-used glass jars (purchased jam, spaghetti sauce, etc.) as well as canning jars w/reused lids. PCC sells a multi-compartment metal lunch box for about $15. Thanks for the various links for stainless lunch containers. I still haven't figured out a way to store things like soups/beans etc. in the freezer though without using plastic containers. Mason jars. Cheap and easy to find. costco is selling boxed sets of glass storage containers. The lockdown lid is plastic, but that doesn't have to touch the food. And the tight seal means you can transport lunch food, even soup, without leaking. We love the to-go ware tiffins. Our now-almost-11yo has eaten off our regular porcelain dishes as well as my grandmother's fine china since he was a baby--and he has not broken a single one. Meanwhile, I have dropped at least one salad plate and broken 3 of our 4 martini glasses, and who knows what else. kidk4m - for freezer and daily lunch storage use, we use these lunch bowls. they are air and liquid tight and you don't have to worry about glass as they are all stainless steel. we will be offering larger, 2 Liter sizes for storing leftovers etc. http://www.happytiffin.com/lunch-bowls.html. We currently have 10% off, promo code WESTWAYS. I was in H-mart up in Lynnwood yesterday and they have a veritable wall full of locking-lid glass containers, including some that can go into a conventional oven, not just a microwave. The lids are polypropylene which is supposed to be the "safest" plastic for food. Hi, that's right, we should eliminate the use of plastic kitchen ware types because it includes BPA or the so called Bisphenol A that causes a bad effects in our health. So, as an alternative we can switch to a stainless steel tiffin carriers. Stainless steel are safer than plastics. You can avail it to Happy Tiffin site, there are different styles and designs available. It's features and functions are really amazing because it has spill-proof and are water tight. You can store liquids in it such as juices, soup, etc. With stainless steel container, you can't have any difficulty in carrying it with you anywhere you go because its design was made just for you. I'm late but better than never. I'm te same as raven. My kids have never used plastic and they haven't broken anyhing. Thy even drink out of huge glass containers and no problem wih spilling. Kids can be very responsible if we allow them to be. We transitioned the kids to real dishes when the youngest was 3. Not as big of a deal as you think it might be. Donated the old ones to daycare. My question is what to send my son to school with. He is allergic to gluten and a host of other things, which makes sandwiches almost out of the question. We've been sending him to preschool where they do microwave his lunch for him, in plastic (a 4 year old with glass in his locker? I didn't think the teachers would approve). How to make a safe meal? Will the little guy go through years of bringing salads to school? Or will I find a gluten free bread that actually turns out? Oh and we have a wrap sack, for my husband to eat sandwiches in the tractor! Pretty handy and I can make more! I store my food in glass containers. For my families lunches, we only use containers once in a while. We use Greentime Reusable sandwich and snack bags by Greentime Creations. http://www.greentimebags.com/ Our lunches are made at night and our sandwiches and snacks have always been very fresh for lunch. I also put wet snacks in them. The bags are BPA, Lead, Phthalate and PVC free so I feel safe using them. We use stainless steel water bottles. I like the idea of using canning jars for food storage. We don't have clear glass but we just use a dry erase board marker on the outside so we can mark contents and date and it easily washes off.